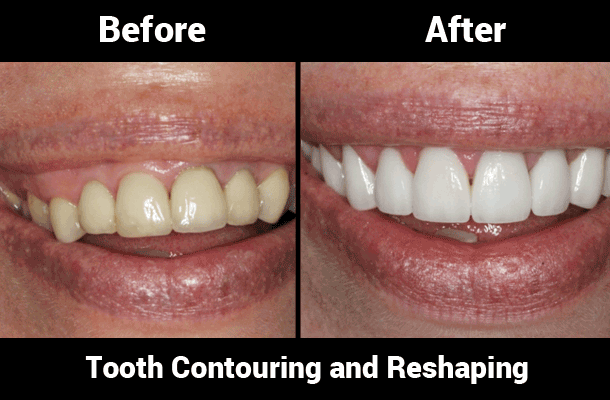 Tooth reshaping, also called dental contouring, is a cosmetic dentistry technique that removes small amounts of tooth enamel in order to change the shape, length, or surface of one or more teeth. Dr. Jacquie Smiles specializes in teeth contouring for her patients in NYC. Defects in teeth can attract unwanted attention and can make people feel insecure and avoid smiling. If you find yourself staring at these subtle yet distracting features in your own smile, help is available with a minimally invasive procedure known as tooth contouring (tooth reshaping). 212-972-3522 or fill out the contact form to receive additional information. Tooth reshaping is performed using dental instruments and abrasion techniques. Dental X-rays may be taken before the reshaping and contouring begin to ensure that your teeth are healthy. A sanding instrument is used to eliminate or minimize imperfections on the surface of the teeth. This is an inexpensive way to improve the look of your teeth. The procedure generally costs $100 to $300 per tooth, depending on how much work is needed. Because only surface enamel is removed in tooth reshaping and dental contouring, there’s generally no discomfort during the procedure and no anesthesia is required. Improves health of teeth. Removing minor overlaps and other imperfections where tartar and plaque can build up lowers your risk of decay and gum disease. Substitute for braces. In some situations, tooth reshaping and dental contouring may be a possible substitute for braces since they make teeth look a little straighter and eliminate minor overlapping. The best candidates for tooth contouring are people in NYC who have teeth that are misshapen or poorly aligned, affecting the overall aesthetics of the smile. They should be in otherwise good dental health and have teeth that are strong and healthy. To schedule your tooth countering (reshaping) consultation with Dr. Jacquie Smiles in NYC, please call 212-972-3522 or fill out the contact form to receive additional information. Her dental office is conveniently located near 30 East 40th St, New York, NY 10016.